Hanoi (VNA) – ​Hanoi recorded a slight increase in the consumer price index (CPI) in May compared to the previous month, the municipal Statistics Office said, but it did not provide the exact figure. The Office said the main reason for this month’s CPI expansion is petrol price hikes. The global petrol price surge was followed by the augmentation of domestic petrol retail prices. Petrol, diesel and kerosene prices rose by 640, 650 and 550 VND per litre, respectively, on May 5. As a result, it cost more when buying building materials such as rock, sand and gravel due to higher petrol prices. 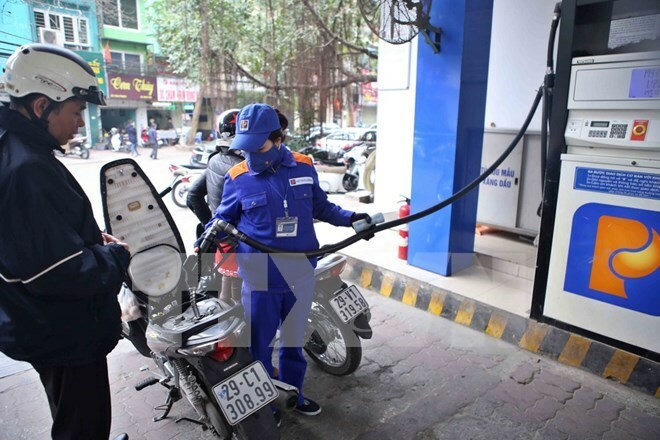 Gas retail prices increased by 5,000 – 7,000 VND to 280,000 VND (12.5 USD) – 300,000 VND (13.4 USD) each 12kg cylinder, caused by the growth in global gas prices. The Office noted that the impacts of El Nino have led to a grain food supply shortage which in turn fueled rice prices in recent months. The forecast prolonged and widespread hot weather will continue affecting rice crops and boosting rice prices. Shortages of pork and prawn supplies also fanned these commodities’ prices, the Office noted, delineating that traders are buying pigs for export to China, and the new farming of prawn in the northern region has just begun. Some summer vegetables costs are down by 10 – 30 percent since April. Summer clothing and footwear prices have also risen due to higher demand.